As the school year comes to a close, we the students need something to relax with. And sense spring splash wasn’t what everyone was thinking we had wet and wild to go too. This is the second year that a student by the name of Darold Badora put on such an event. He was quoted saying ” I just want my last time here to be fun and why not have some people come by the beach and have same fun. Wet and wild takes place at Whitewater beach on Whitewater lake, around 10 minutes away from campus. And believe me the whole campus was there. Well like 1 to 2 hundred people. In my interviews I got word that everyone liked it and in hopes it happens next year. People dressing up in some their favorite video game character was the scene at Milwaukee Mighty Con this Saturday. Over 200 venders, artists, and special quests packed into the Wisconsin State Fairgrounds Products Pavilion. The event was so big last year it had to change locations this year to hold the larger anticipated crowd. And that there were, as a person who has never been to such an event, it was eye opening to see all the different kinds of people there. From the crazy costumes to the large pack of people all ages sitting around a TV watching others play Super Smash Brothers; there was a lot to take in. Loads and loads of vastly different artiest showing off the best art they have to offer. Many of the artiest have more than just something to look at, they have a story. Sometimes those stories are pretty inspirational, like Mitchell Blumenshine who is an inspiring freelance artist looking for a way to make art for a living. Mitchell has only been doing shows like this for roughly two years now and seems to be doing well. The art we see today didn’t always stand out like today, with an absent father in his life who was also an artist, Mitchell tried to shun the artist that was in him “I didn’t want to be like him”. But around high school is when it changed and decided not to let his father distract him from what he wanted to become “I eventually got over it, this is my passion, it’s not about him so I buckled down because this is what I love to do.” Like many artiest, they need to catch a break in order for their art to truly shine, and Mitchell Blumenshine seems to be headed in that direction. But there was something else that was just as spectacular as Mitchell’s art, and that was Dr. Strange? 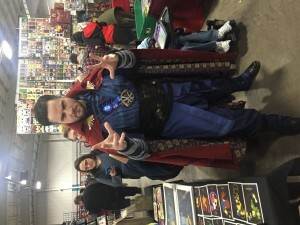 At Mighty Con there is a best costume contest and the winner was a man dress as Doctor Strange from the new Marvel movie “Doctor Strange. “Doc, it came before the costume” was his answer to what his real name was, which was a bit of a shock to me. People really call him Doc as it was a childhood nickname he got well before the love for Dr. Strange. This real name actually, being Rob brings up the question where did he get the nickname Doc? “I was in high school when I used the internet handle Doc, like Doc from Back to the Future.” Make no mistake Robs costume was very remarkable, which makes sense as to why he won best costume. All in all, I think my first experience at Mighty Con was good, and might even go back next year.